Healthy, delicious and pairs well with wine! Those are my three favorite qualities of home cooked food. Sometimes I hit that sweet spot straight on, with healthy, low fat, fresh, local food that enhance (and are enhanced by!) the perfect wine. I must be honest: sometimes I miss. Big Time. For example, strawberry rhubarb pie and viognier sweet wine (MISS). But, sometimes I hit it straight on! 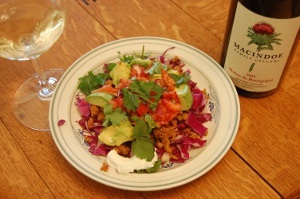 And, that was the case last Wednesday with my Turkey Tacos with Strawberry Salsa paired with our 2009 Melon de Bourgogne. The light, fragrant, lemon-lime flavors of the Melon pair perfectly with the lime flavors in the strawberry salsa, and were rounded out nicely by the browned lean turkey. Also the salsa, which has a bit of a spicy kick, was offset on the palate by the crisp, refreshing mouthfeel of the ’09. Here’s the recipe if you want to try it out at home! Chop up about three cups of strawberries. Throw in bowl. Take sip of wine. Grab a handful of cilantro, yank it off the stalk, and chop it up into little bits. Throw in bowl with strawberries. Take another sip of wine. Juice one lime into bowl. Now it’s jalapeno time. I usually use about 1/3 of a whole jalapeno (with the seeds taken out), but you can put in as much as you like. Cut up about a 1/2 cup of red onion into little bits. And you guessed it, into the bowl! (Take sip of wine). Then salt and pepper to taste. I like to make it at least an hour ahead of time so the flavors can mingle, but ya know you can make it and serve it right away if you don’t have the luxury of waiting. Now get out some little bowls to make a create your own taco bar. I like bowls with chopped up: red cabbage, cilantro, avocado, and sour cream. Sometimes, if I’m feeling zesty, I’ll put one out with low fat light flavored cheese, but that, in a way, defeats the purpose of the healthy aspect of my triumvirate of meal requirements (nutritious, tasty, pairs with wine). If you don’t feel like making little bowls, you can also take a totalitarian approach and make everybody’s taco for them. Fewer dishes! Now, let’s talk turkey. I always say, the leaner the better. Although, I admit that I went for the 93% instead of the 99% because it was $3 cheaper. $3! I guess it must cost a lot of money to put all of those birds on turkey treadmills on turkey bikes. Brown that turkey up with a tad of olive oil. Heat up some tortillas, corn, flour, fancy, not fancy, taco shells, or even just tortilla chips if you want to make a taco salad. I personally eat mine without a tortilla aspect, preferring to load up on red cabbage as the crunchy, satisfying part of the meal. Take sip of wine, tell a joke to whoever’s closest to you. Now you can file your family and friends through in a turkey taco assembly line. Hopefully you took the Melon out of the fridge fifteen minutes ago to get it to the just right temperature to bring out all the flavors.